The M5 Competition may not be such a big secret after all. The current F90 generation BMW M5 is already a savage car, pumping out 600 horsepower and 553 lb-ft of torque from a 4.4-liter twin-turbo V8. Clearly BMW isn't done yet because the company is working on a more powerful Competition Package, rumored to be revealed some time in April. We'd image BMW would want to keep details about the Competition Package close to the chest, but a forum member on Bimmer Post claims not only to already have one on order, but to have lots of details about the M5's optional package. Forum member "ljb" claims to have ordered the M5 Competition last month with a build date and estimated delivery date confirmed over the phone. The car was ordered through a BMW-owned and operated dealership in Australia, which is why they were given the important details about the car. We'll have to take this information with some hesitation, but we should know for sure when BMW reveals the car in a few weeks. According to the forum post, Australia has been allocated 20 cars, and first edition and launch edition models are already sold out. The Competition Package costs $20,000 (we assume Australian dollars) and comes with a variety of features. The Competition Package will reportedly include: Bowers and Wilkins audio, a standard carbon fiber engine cover, lowered suspension, black grilles, badges, and side vents, 460kw (616hp), and sports exhaust with package specific exhaust tuning to produce crackling burbles on the over run. 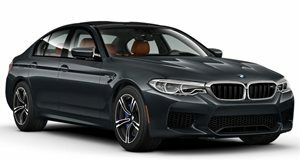 The M5 is already an impressive sport sedan, but it sounds like the Competition Package will be the one to buy. Sorry to anyone who already bought the standard car.